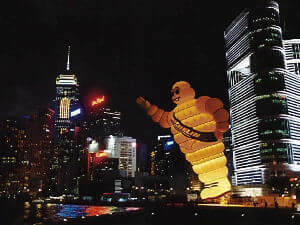 Hot Air Balloon advertising can generate the biggest retention rate by visual impact: A Hot Air Balloon, more than 20 meters high and offering more than 270m2 of advertising surface. Did you know that a Hot Air Balloon focuses the attention of 90% of the people who see it and that 90% of this audience tell friends, family or colleagues that they have seen it? 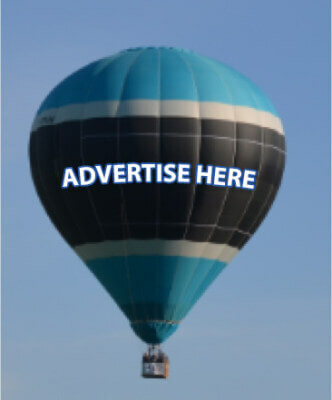 This type of aerial advertising presents a lot of advantages compared to other advertising media. Simon has worked extensively on many successful high profile corporate balloon advertising programs including Michelin, Motorola, The Racing Form, and The Financial Times newspaper. He also spent 5 years owning and operating the Cancer Research UK hot air balloon, raising awareness for the charity all across the UK and involving many high profile celebrity and political figures. Using giant banners fixed upon the envelope of one of our Hot Air Balloons. A banner is generally 70 feet long and 21 feet wide. Two banners of this size can be placed onto a balloon. 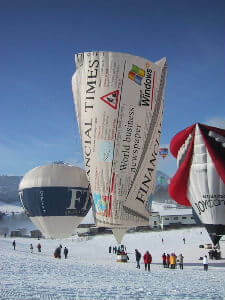 It is also possible to decorate two faces of a hot-air balloon’s basket. 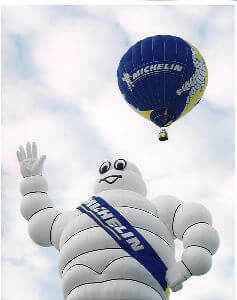 A hot air balloon is especially designed with the shape and the design wanted by your company. This option allows you to get a perfect result totally in accordance with your brand image. It is the best option for a medium to long term advertising campaign. A specialized corporate advertising programme can be put into place. The balloon can be flown over certain designated areas both locally or nationally. We inflate the hot air balloon to position the basket at 15 – 20 metres up from the ground. It acts as a giant moving billboard, being especially impactful when illuminating by its flame during the night tethered flight. The advertising captive flight generally lasts 2 hours, or more according to your needs. How can you use a tethered balloon? In venues of all kinds, industrial or commercial events or in places with a strong concentration of people. Promotional events, team building, incentives, weddings, television, films, etc.